» How fast are electrical signals propagated in cells? How big is an E. coli cell and what is its mass? How big is a budding yeast cell? How big is a human cell? How big is a photoreceptor? What is the range of cell sizes and shapes? How big is the endoplasmic reticulum of cells? How big is a synapse? How big are biochemical nuts and bolts? Which is bigger, mRNA or the protein it codes for? How big is the “average” protein? How big are the molecular machines of the central dogma? What is the thickness of the cell membrane? How big are the cell’s filaments? What is the elemental composition of a cell? What is the density of cells? What are environmental O2 and CO2 concentrations? What quantities of nutrients need to be supplied in growth media? What is the concentration of bacterial cells in a saturated culture? What is the pH of a cell? What are the concentrations of different ions in cells? What are the concentrations of free metabolites in cells? What lipids are most abundant in membranes? How many proteins are in a cell? What are the most abundant proteins in a cell? How much cell-to-cell variability exists in protein expression? What are the concentrations of cytoskeletal molecules? How many mRNAs are in a cell? What is the protein to mRNA ratio? What is the macromolecular composition of the cell? What are the copy numbers of transcription factors? What are the absolute numbers of signaling proteins? How many rhodopsin molecules are in a rod cell? How many ribosomes are in a cell? What is the thermal energy scale and how is it relevant to biology? What is the energy of a hydrogen bond? What is the energy scale associated with the hydrophobic effect? How much energy is carried by photons used in photosynthesis? What is the entropy cost when two molecules form a complex? How much force is applied by cytoskeletal filaments? What are the physical limits for detection by cells? How much energy is released in ATP hydrolysis? What is the energy in transfer of a phosphate group? What is the free energy released upon combustion of sugar? What is the redox potential of a cell? What is the electric potential difference across membranes? What is the power consumption of a cell? How does metabolic rate scale with size? What are the time scales for diffusion in cells? How many reactions do enzymes carry out each second? How does temperature affect rates and affinities? What are the rates of membrane transporters? How many ions pass through an ion channel per second? What is the turnover time of metabolites? What is faster, transcription or translation? What is the maturation time for fluorescent proteins? How fast do proteasomes degrade proteins? How fast do RNAs and proteins degrade? How fast are electrical signals propagated in cells? What is the frequency of rotary molecular motors? What are the rates of cytoskeleton assembly and disassembly? 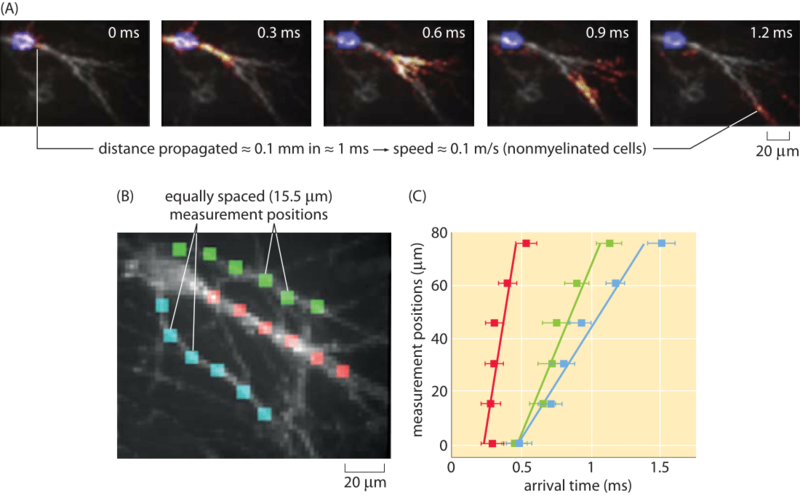 How fast do molecular motors move on cytoskeletal filaments? How fast do cells move? How long does it take cells to copy their genomes? How long do the different stages of the cell cycle take? How quickly do different cells in the body replace themselves? How many chromosomes are found in different organisms? How many genes are in a genome? How genetically similar are two random people? What is the mutation rate during genome replication? What is the error rate in transcription and translation? What is the rate of recombination? How many cells are there in an organism? How many chromosome replications occur per generation? How many ribosomal RNA gene copies are in the genome? What is the permeability of the cell membrane? How many photons does it take to make a cyanobacterium? How many virions result from a single viral infection? 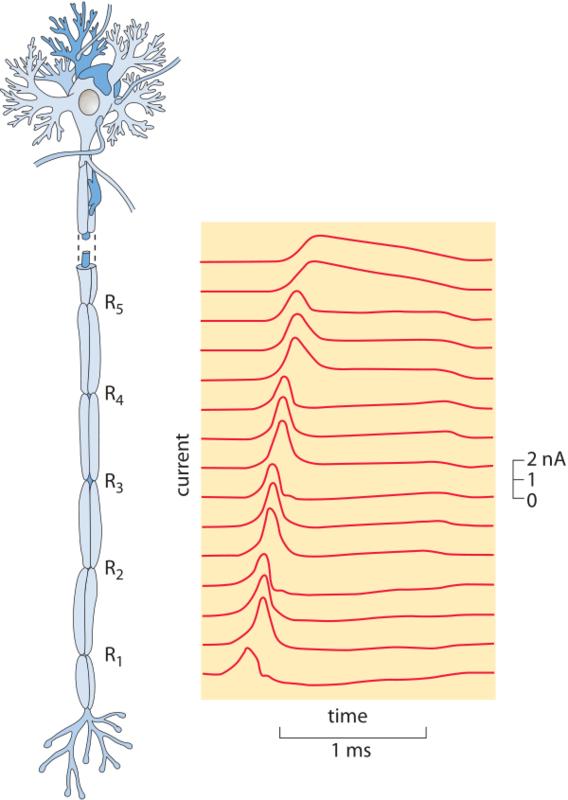 Nerve cells are among the most recognizable of human cell types, noted not only for their enormous size relative to many of their cellular counterparts, but also for their unique shapes as revealed by their sinuous and elongated structures. Already in the early days of microscopy, biological pioneers found these cells a fascinating object of study, with van Leeuwenhoek musing, “Often and not without pleasure, I have observed the structure of the nerves to be composed of very slender vessels of an indescribable fineness, running length-wise to form the nerve”. See Figure 1 for several examples of the drawings made by van Leeuwenhoek as a result of his observations with the early microscope. The mystery of nerve cells went beyond their intriguing morphology as a result of their connection with electrical conduction and muscle action. 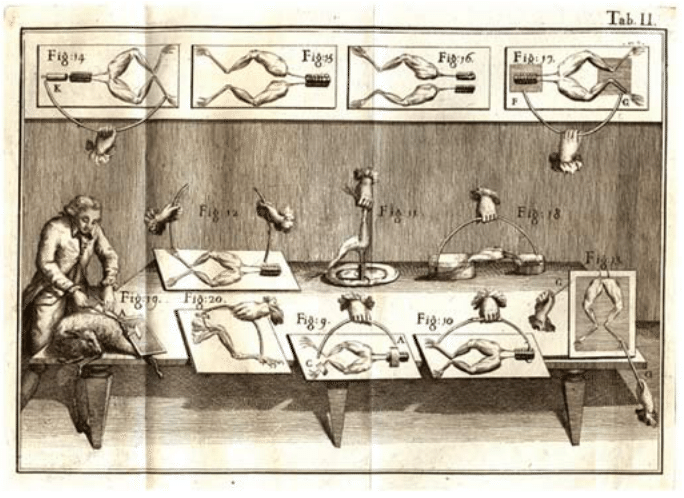 In famed experiments like those shown in Figure 2, Luigi Galvani discovered that muscles in dead frogs could be stimulated to twitch by the application of an electrical shock. This work set the stage for several centuries of work on animal electricity culminating in our modern notions of the cellular membrane potential and propagating action potentials. These ideas now serve as the cellular foundation of modern neuroscience. Figure 2: The experiments of Luigi Galvani on the electrical stimulation of muscle twitching. Using a dead frog, Galvani discovered that he could use an electrical current to induce muscle twitching, lending credence to the idea that nervous impulses are electrical. Figure adapted from Galvani’s book De Viribus Electricitatis in Motu Musculari (1792). In the middle of the 19th century, the mechanism of nervous impulses was still hotly contested with wildly different competing mechanistic hypotheses, similar to early thinking on the motions of bodily fluids such as the blood. Just as Harvey’s measurements on the flow of blood largely resolved the debate on the mechanism of blood circulation, a similar situation unfolded in the context of nervous impulses. One of the key measurements that set the path towards the modern understanding of electrical communication in nerve cells was the measurement by Hermann von Helmholtz of the speed of propagation of such impulses. 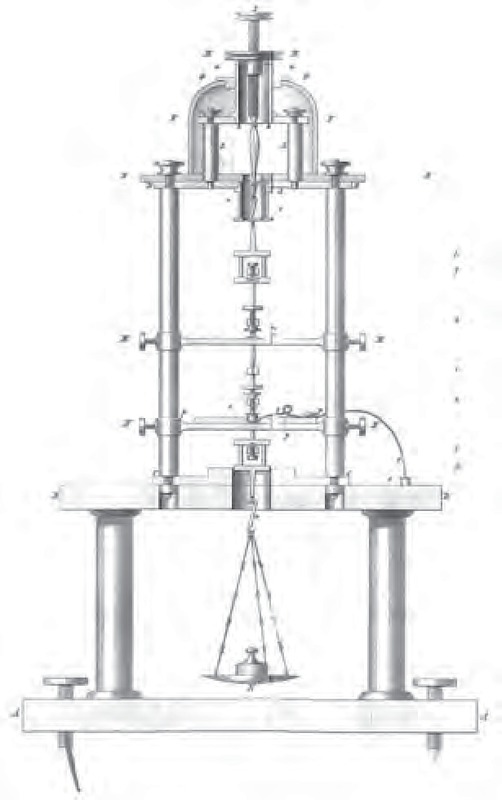 The apparatus he used to make such measurements is shown in Figure 3. Helmholtz tells us “I have found that there is a measurable period of time during which the effect of a stimulus consisting of a momentary electrical current applied to the iliac plexus of a frog is transmitted to the calf muscles at the entrance of the crural nerve. In the case of large frogs with nerves 50-60 mm in length, this period of time amounted to 0.0014 to 0.0020 of a second.” If we use his values of 50 mm as the distance of propagation and 1.5 ms as the propagation time, this leads to an estimate of 30 m/s for the propagation velocity of the nerve impulse. This value compares very favorably with the modern values of 7-40 m/s for frogs, depending on axonal diameter (BNID 110597, 110594). Helmholtz’s measurement of the velocity of nervous impulses was inextricably linked to mechanism. Specifically, it helped dispel earlier notions where the propagation of nervous impulses had been attributed all sorts of mystical properties including some that posited instantaneous communication between different parts of the same cell. Without the measurement of a finite velocity, the ideas on how it worked remained muddled. In the time since, numerous measurements have confirmed and extended the early insights of Helmholtz with a broad range of propagation speeds ranging from less than a meter per second all the way to over a hundred of meters per second (the fastest taking place in a shrimp giant fiber with a value over half of the speed of sound! (BNID 110502, 110597). Figure 4 shows the results of one of these classic studies. Determining the mechanistic underpinnings of variability in the speed of nervous impulses has been one of the preoccupations of modern neurophysiology and has resulted in insights into how both the size and anatomy of a given neuron dictate the action potential propagation speed. An important insight that attended more detailed investigations of the conduction of nervous impulses was the realization that the propagation speed depends both on the cellular anatomy of the neuron in question such as whether it has a myelin sheath (increasing the propagation speed several fold) and also on the thickness of the nerve (propagation speed being proportional to the diameter in myelinated neurons and proportional to the area in unmyelinated neurons). Early work on impulse conduction along peripheral fibers by Erlanger and Gasser, for which they shared the Nobel Prize in 1942, demonstrated remarkable relationships between the conduction velocity of the axons and the type of neuron and thus the information that they conveyed. 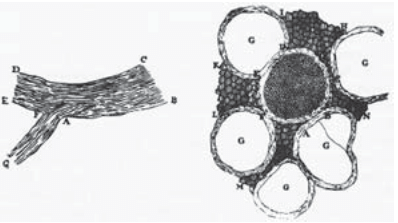 The largest motor fibers (13-20 μm, conducting at velocities of 80-120 m/s) innervate the extrafusal fibers of the skeletal muscles, and smaller motor fibers (5-8 μm, conducting at 4-24 m/s) innervate intrafusal muscle fibers. The largest sensory fibers (13-20 μm) innervate muscle spindles and Golgi tendon organs, both conveying unconscious proprioceptive information. The next largest sensory fibers (6-12 μm) convey information from mechanoreceptors in the skin, and the smallest myelinated fibers (1 –5 μm) convey information from free nerve endings in the skin, as well as pain, and cold receptors. One of the beautiful outcomes of recent fluorescent methods is the invention of genetically encoded voltage reporters. These molecular probes have differing fluorescence depending upon the membrane voltage. An impressive usage of these methods has been to watch in real time the propagation of nerve impulses. Specifically, the readout of the passing of such an impulse comes from the transient change in fluorescence along the neuron. An example of this method is shown in Figure 5. We note these alternative methods because of the strict importance we attach to the ability to measure the same quantity in multiple ways, especially to make sure that they yield consistent values. Can we connect the reported action potential speeds in humans of 10-100 m/s (BNID 110594) to our human response limits? From the moment of hearing the firing of the starter’s pistol in a 100-meter dash to activating the muscles in the feet, at least one meter of impulse propagation had to take place. This dictates a latency of 10-100 ms even before taking into account all other latencies such as the processing happening in the brain and the propagation time due to the finite speed of sound in air. Indeed in a 100-m dash race, the best athletes have response times of roughly 120 ms (BNID 111450) and anything below 100 ms is actually disqualified as a false-start according to the binding rules of the International Association of Athletics Federations. If the propagation speed of nerve impulses were significantly slower, running races as well as soccer games or indeed most sports events would be much less interesting to watch. Speaking of watching, we know that when shown frames at the standard rate of 24 Hz the brain sees or interprets the movement as continuous. It is interesting to speculate what the frame rate would have to be if our action potentials were moving at, say, 1000 m/s.